Okay, please stay with me here because I’m going to use a movie as an example and ask you a very important question along the way. 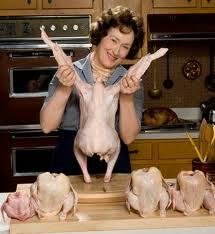 Previously, I had only seen bits and pieces of “Julie and Julia,” the movie, but recently I saw the entire film. Briefly, for those who haven’t seen the movie, it’s based on Julie Powell’s book Julie and Julia: 365 Days, 524 Recipes, 1 Tiny Apartment Kitchen (paperback edition retitled Julie and Julia: My Year of Cooking Dangerously). Powell’s book and subsequently the movie were the result of her blog about her attempting to cook all the recipes in Julia Child’s Mastering the Art of French Cooking in 365 days. To perk up her dull life of temp job, geeky husband, small apartment over a pizza place, Powell blogged 365 consecutive days about her experience cooking 524 recipes from Julia Child’s book, Mastering the Art of French Cooking. The blog received a grand following and resulted in the book and movie mentioned above. 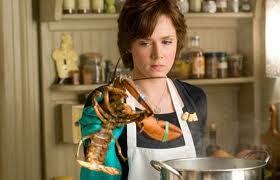 The movie is delightful with Julie Powell being played by Amy Adams and Meryl Streep playing the part of Julia Child. Watching the movie, I wondered what I could blog about for 365 consecutive days. (Not cooking, for sure!) If I could, who would be interested in reading them? What would you want to read about EVERY day?
? So, my question to you is, what suggestions will you give me about a 365-day blog that would interest you (in my case, blogging twice a week would be a 104-day commitment)? We could all blog about our grandchildren all year but everyone doesn’t have grandchildren, so that wouldn’t be a universally interesting blog. I recommend that you write what interests you instead of writing what you think people want. The reason being, good writing comes from the heart. If you're passionate about something, you'll write about it and be more effective. And you'll attract readers who are interested in your passions. Thanks, Eddie. Sounds like good wisdom there. OK, I was posting and when I tried to edit a sentence, it ate my entire post! Ah well. That means I'll be more concise, which is probably for the best. Still kind of rambling though; sorry. *I tried to find that Julie/Julia blogger's site and the posts I found made me LESS interested in the movie (lots of cursing in the blog and she just didn't seem very nice, though I didn't read deeply). *IMO one reason blogs become popular are interesting content (and the Julie/Julia thing was also DARING, with a deadline--if she'd said she would cook one recipe a month, or even a week, that would probably not have done anything, but the whole cookbook in a year--that's interesting!). Taking risks is good. *Another reason blogs hit it big is Providence/luck (you can't tell me there aren't much better bloggers than her out there, that get do not get book deals). *The Julie/Julia thing was far from universal appeal, IMO--I'd suggest you find something that appeals to a substantial segment of people, but don't need to please everyone, or even half of everyone. *I don't know what your passion is, and if I told you to write the kind of things *I* find interesting, you might entertain me, but would probably bore your readers and (perhaps worse), yourself. And judging from the traffic on my blogs, which are mostly topics I find fascinating, you STILL probably wouldn't get many hits, LOL. And I said a prayer that God will guide you to what to do. :) Take care! Julie, thanks for all you thoughts. Passion about something seems to be the key. Blogs are interesting creatures. Some of them take off and get scads of followers. Some of them, as Julie says, are better but don't find the right readers. I liked the posts I read of yours, but to be honest, I don't have the time to follow blogs. I enjoy reading them when I do click through to one, but I don't think I could commit to an every day reading. I do a blog, One Writer's Journal, and when I started it I said I was just going to have fun with it and not worry if nobody showed up. A few people have shown up to read it, but I don't get many comments the way a lot of writers who blog do. That may be because my content is not interesting enough. Or it's too hard to comment and I've tried to comment on blogs and given up in frustration before. So my advice would be to go for the one subject for a year if you think it would be fun. Or stay the way you're doing it now if you're finding that fun. Me, I love to write and I've always loved to journal - write about whatever is on my mind. So that's what I do. With very few expectations. But comments now and again are always encouraging for us writers pouring our hearts and souls into words and thoughts.